LANSING — Michigan's tourism division has hired a new company to study the effectiveness of the state's Pure Michigan advertising campaign. The Michigan Strategic Fund board on Tuesday approved a three-year contract for Indianapolis-based Strategic Marketing and Research Insights starting in 2018 to evaluate the tourism marketing and branding campaign's return on investment. The Michigan Economic Development Corp. said in a memo that Strategic Marketing narrowly edged out Toronto-based Longwoods International, which has had the state contract since 2006. Strategic Marketing's contract is worth an estimated $92,500 per year, or $277,500 in full, according to the MEDC. It is set to expire in the 2020 fiscal year, though the agreement comes with two one-year extensions. The MEDC has hired a company to analyze the cost effectiveness of the Pure Michigan campaign since it launched in 2006. In 2016, Longwoods' research found, the state invested $12.9 million into the Pure Michigan ad campaign, generating 5 million trips and $1.5 billion in new visitor spending. For every $1 the state invested in the campaign, Longwoods found, Pure Michigan returned $8.33 in tax revenue when combining its reach in the region and nationally. The company surveys travelers and uses its own methodology to calculate ROI. Longwoods' findings have elicited criticism, notably from the Midland-based Mackinac Center for Public Policy, which contends the numbers are inflated and criticizes a lack of transparency in the firm's modeling tool. Longwoods executives said the company's methodology is proprietary and confidential. The most recent contract with Longwoods ran Dec. 1, 2015, through Nov. 30, 2016, and was worth $229,000, said Michelle Grinnell, a spokeswoman for Travel Michigan. That includes the return-on-investment analysis, as well as a competitive analysis worth $15,000 and an economic impact review worth $65,000 and subcontracted to Wayne, Pa.-based Tourism Economics Inc., Grinnell said. 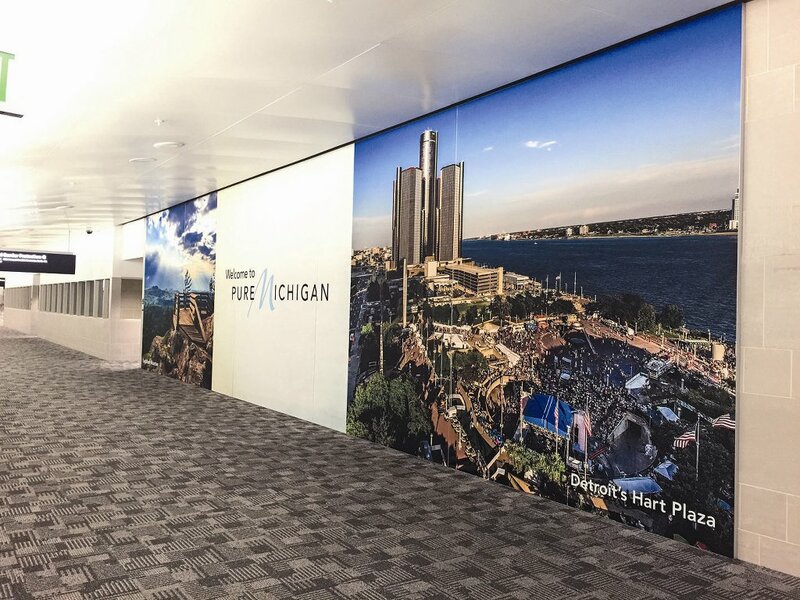 Travel Michigan's request for proposals, issued this summer, specifies that the winning bidder will be expected to study the Pure Michigan campaign's effects on the state and awareness among travelers of the brand and the ad spots, among other things. The results are expected to be shared in March at the Pure Michigan Governor's Conference on Tourism. "Having insights into messaging and marketing efforts that are working, and what could be working better, will continue to be critical as Travel Michigan moves forward with efforts to evolve the Pure Michigan campaign," David Lorenz, vice president of Travel Michigan, said in an emailed statement. "Research and data are the cornerstone of that strategic planning effort." Lorenz stressed that while the campaign's ROI results often get the spotlight, it is the marketing insights that make up the vast majority of the annual insights report and that inform the creative and strategic direction of the campaign. they need to have more proper tourist sites if they are going to encourage tourism. From Bay City State Park you get a lovely view of smoke stacks... not very inviting. Plus the park is blocked from upgrades because of DEQ regs. They need easier beach access and less marsh along the main drive. There is plenty of space for marsh in the back space. Why is the state sending money to an out-of-state entity to provide this service? The guidelines for most services provided by the MEDC to startups require that the service provider by Michigan-based - why doesn't the MEDC follow its own rules? The firm selected appears to have pretty deep experience doing tourism-related quantitative research. While there are a number of good-sized research companies in Michigan, most likely do not have that exact experience. On the budget MEDC appears to be working with (92.5K a year, which sounds like a lot but isn't for a big quantitative study), they'd probably need to work with a research company that already has a model in place to work from, rather than starting from scratch . . . and risk having a lot of bugs to work out. It makes more sense to go with a company that has an established record doing exactly this kind of study, wherever it is, to make sure the taxpayers of Michigan get their money's worth. this is typical bureaucratic nonsense. Do as we say not as we do is the MEDC mantra. Perhaps a Michigan firm with related experience might give a less generic type of estimate or evaluation. I work in the evaluation business and I'm not sure there is a company in Michigan capable of doing what these out-of-state firms do routinely. That doesn't mean that an in-state company can't give it a try and climb up the learning curve. If anybody knows a firm in Michigan that does this, they should speak up. And I have to ask Business Bridge if they know of any in-state firms that submitted a proposal.
" A. Systematic Inquiry: Evaluators conduct systematic, data-based inquiries. 3. Evaluators should communicate their methods and approaches accurately and in sufficient detail to allow others to understand, interpret and critique their work. They should make clear the limitations of an evaluation and its results. Evaluators should discuss in a contextually appropriate way those values, assumptions, theories, methods, results, and analyses significantly affecting the interpretation of the evaluative findings. These statements apply to all aspects of the evaluation, from its initial conceptualization to the eventual use of findings." I trust that Michigan Strategic Fund Board would make certain demands of Strategic Marketing and Research Insights company to a.) obtain a proper oversight position; b.) demand a platform of transparency; and c.) set the stage for an evaluation report that will be well developed and executed, thus providing information of true value to the stakeholder-citizens of the State of Michigan. Further, it could be beneficial if the Michigan Strategic Fund Board would engage a professional evaluator to assist in structuring, monitoring, and interpreting the work of Marketing and Research Insights. are no firms in Michigan who could do this work.